Do to many requests, we’re reprinting the book 3D Construction Modeling and distributing it to booksellers and offering it again on Amazon. The book includes a trial version of SketchUp V4, which is a much simpler and basic program than Google SketchUp. V4 has black and white icons, V5 has color (and new icon shapes) and an organizer called the Outliner. The Google SketchUp version adds a bunch more stuff like Layout, performances, sketchy edges, warehouse imports, photo match, etc. All design features that are not always necessary for most construction models. At least we never use them. The book covers the fundamentals of building a piece-based construction model using the tools you find in all versions of SketchUp, but does not go beyond what is necessary to plan, layout, and build a construction model. This includes site planning and site layout modeling and subsequent chapters on how to fabricate and install the pieces of a wood frame building (and take them apart). 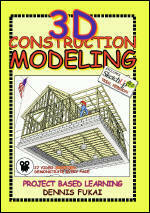 There is also a chapter on shade and shadow, animation, and other simple effects in SketchUp. The value of this book is that it introduces the reader to the basics of construction modeling using this simpler version of SketchUp — making the transition to the current version easier. It remains popular because it helps readers understand the piece-based concept of assembly and production modeling. We are publishing a companion to this book later this year titled “How a House is Built.” The new book is not an upgrade in that it will not be a step–by-step hands-on learning experience like this one. But it will show how both a house and a construction model of the house are built using Google SketchUp, including mechanical, electrical, and plumbing as well as a “How To” page with video demonstrations rather than tutorials. 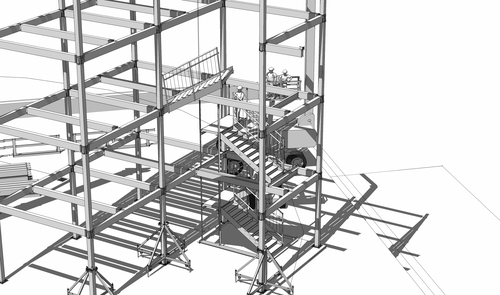 We’re sharing this email for those considering alternative 3D construction modeling programs. It’s a direct cut and paste from an email response to Abdol Chini, Director, Rinker School of Building Construction, Univ of Florida and since it is just Dennis’s humble opinion, comments are welcome. IMHO Revit is the wrong direction for a const school — tho it makes great sense as a draftg tool in an arch school b/c 3D models are para-linkd to 2D dwgs — by the *design professional* (arch/engr not constructors). 1. Revit is a draftg prog. This makes it important to compare apples to apples. IOW, is the goal draftg?? Or modelg?? Or construction?? ACADs strength is that it is both a 2D drafter and a very advanced 3D modeler. Tho slowly antiquated as a drafting prog, most do not see ACAD as the underlying 3D modeler. For ex, I can remember when Prin, Mark and I went to Haskell to demo Prin’s research (I think in ’99), there was an audible gasp from the drafters and architects when we spun a 2D dwg in 3D. IOW, they never used the ACAD 3D environ other than to draft in 2D. Which is why it is no longer a viable prog. This is important because the 3D models extracted by Revit and many other programs use the same modeling engine powerg ACAD today. We (Rinker) began using the early version of this engine to build what are now called BIMs when it was first released in R14 (1997/8…wow, long time ago). In sum, Revit is the 2D component of the underlying 3D software system, it extracts 2D docs from 3D models (parametrically). Is that what you want? 2. Upgrade req’d to graphic workstations. There’re only a few good laptops (DELL M90/+ Precision Workstation or G6) that can run Revit once the models and linkd dwgs go beyond a simple bldg (file size). Using Revit would mean a big commitment by both the school, faculty, and students to purchase high-end graphic workstations (and learn to use them). My M90 cost $4100, and our now-belo-avg-graphic-desktop workstation came to around $6500 — the money is in upgrading a std platform with faster graphic cards, memory, and monitors. 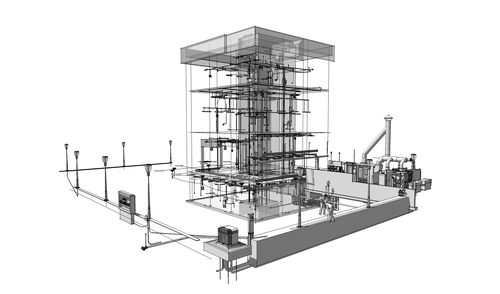 Revit will run on lesser machines, but not for long…as complexity increases. 3. Question the value of “BIM” to construction managers. Few construction students I know (knew..) would be interested or motivated enough (let alone faculty) to learn Revit, especially in a single 3unit semester/year. It is a deeply complex prog and will take a long time to master — and I’m not sure to what purpose (for a CM)? Perhaps thgs have changd at Rinker, but I found students only wanted to know what they needed to know to be effective CM/PMs and had no interest in draftg. 4. Very steep learng curve. Even with the simplified versions we used at Rinker 12 years ago, modelg was a challenge. We did great work and many “ex” students still jokingly email about the models we built in those early days of ACAD R14/2000/i, but we also tortured a lot men and women who had no interest in understdg how to model (let alone draft…) in ACAD or any other prog. Pushg a class up that learng curve would miss the real value in BIMs and how they can be used as true const info models (which differ from BIMs). There’s probably more but basically I would recommend keepg it simple and tryg to move 3D into and across the curriculum as a communications tool and not lose focus on the importance of 3D as a tool to visually (graphically) manage/transfer ideas and info. There are several progs offering this capability, but Google SketchUp is the one that seems to be catching on universally. Primarily b/c its free…and its Google. With the promise of Building Information Models (BIMs) becoming increasingly important in both the design and construction of engineered structures, it might be a good time to step back and take a realistic look at the real potential of these new technologies for our industry. In fact, this technology has such a strong visual presence it’s hard sometimes to separate the promise from real potential. Take for example the underlying responsibility for the information transferred in one of these models. Disclaimed and often undisclosed, few designers are ready to assume liability for either the model or the information it might (or might not) contain beyond the resulting collection of contract documents. In other words, though spatial data, net area and efficiency ratios, program compliance, and energy performance might be extracted as information from a BIM model, it continues to be the responsibility of the contractor to cross check and verify any contractually relevant information represented in the computer generated data. That means the “I” in BIM is just that, information, and much more of it. This is clearly evident in recent discussions among design professionals working to incorporate BIM models into the production of construction documents. Here in fact is where BIMs have their real potential. The dream is to use software and computers to seamlessly transfer a design model into a set of construction documents. This can be accomplished in two ways. The simplest method is to graphically export two-dimensional images of the three-dimensional model into a CAD drafting program where they can be scaled, dimensioned, and annotated as part of a set of construction documents. However, by definition the goal is to use more complex programs to parametrically link the model with a two-dimensional drafting program so that any change to the three-dimensional model is automatically reflected in a two-dimensional drawing (and vice versa). In fact, according to the General Services Administration (GSA), without this parametric intelligence it is not a true building information modeling. Interestingly, both the design professionals and construction managers are expected to use these models to produce shop drawings, field drawings, estimates, and schedules. This of course blurs the line of liability issues under a one-for-all-and-all-for-one approach to project development and cast the shadow of an even more litigious project life-cycle for both designers and constructors. What we are beginning to see as a result is the automated production of a collection of two-dimensional drawings, reports, and volumes of specifications, all automatically generated by a computer. Every bit of this information must then be verified just like any other set of construction documents, except it is now camouflaged by the constantly increasing ability to generate more documents, quantitative reports, and graphic information than ever before. 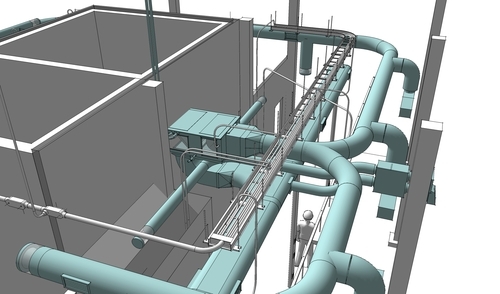 The result is that this great new BIM potential for engineers and architects leaves construction professionals on the receiving end of a fire hose of automated and unverified data with few options and no equivalent three-dimensional tool with which to respond. Of course, some construction companies are able to tap into these innovations by training and hiring more technically inclined constructors and putting them to work either closely coordinating the production of the three-dimensional models or developing an in-house modeling department. 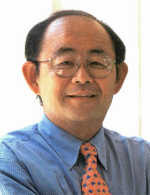 However, the implications of this level of integrated and collaborative approach are again shadowed by the responsibility for the resulting information — essentially moving the construction professional wherever possible into a role of monitoring the production and accuracy of the design model in order to understand the underlying basis for the final contract documents. And that’s assuming both the modeling and construction expertise of the construction manager fit the scale of the project. In reality, every one in the industry knows that it’s very rare for a project of any complexity to evolve in a systematic and orderly fashion. Clients are often faced with dynamic market conditions that mean adjustments must be accommodated not only through document production, but often onto the jobsite. At the same time, design professions deal with an ever increasing array of new materials and methods. The challenge is to coordinate and incorporate these new technologies into details and documents that must support a carefully negotiated legal contract. The resulting process may appear to academics (like me) as a wonderful occasion for what the GSA calls an open and transparent “integrated spatial program.” And there is no doubt that it is, but the reality of competitive pricing, materials shortages and the cost of doing business, and regulated complexity of a jobsite make it no more than a dream in the real world of the mainstream construction company. What constructors need is a corresponding modeling tool. 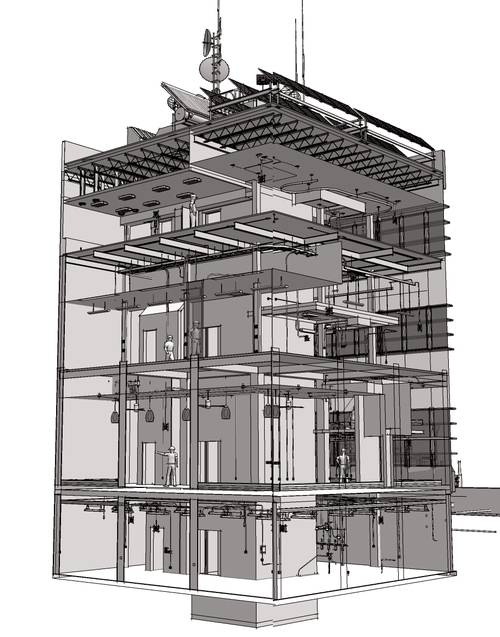 BIM for the contractor is not about spatial relationships, visualization, or building performance. It’s about intelligently and dynamically automating the daily challenges of the construction contract. What are required are construction models. A construction model differs from a design model for three fundamental reasons. First the model must be piece-based. Not just object oriented, but virtually definable in components that make real sense on a jobsite. To a contractor information goes far beyond unit counts and much more deeply into piece-based relationships of fabrication and assembly. This makes the number of bolts or windows in a building immaterial when considered in the context of their installation during real world project production. In the field, this means information must be available on the fly, day-to-day and hour-by-hour, intuitively variable. 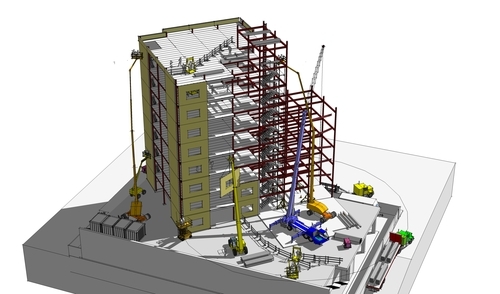 A construction model must be fast, flexible, and feasible. Simple to build, change, and manipulate and accurate enough to visually test or illustrate a field operation. Second the model must be able to capture the process and sequence of multiple operations. In other words, the model must be able to go far beyond simplistic 4D phasing. Construction models are organized according to a detailed and robust work breakdown structure. They must of course include time, but they must also include the variables and alternatives that come from frequently changing schedules that almost never seem to follow the original plan. Finally, a construction model must capture both the means and methods of a construction. This includes all the tools, machines, equipment, scaffolding, and falsework necessary to complete the project according to the contract documents. These are clearly critical elements of the construction process that are not shown in a BIM model, included in the specification, or parametrically linked to two-dimensional drawings. It’s important for constructors to recognize the difference between these two radically different approaches to intelligent modeling systems. A BIM model is a (hopefully) realistic representation of the project. Its value to a designer is that it will (hopefully) automatically generate a set of construction documents. Its value to the client is that it (hopefully) accurately represents spatial and performance values in that design. But its value is diminished to the construction professional because it only takes a small step toward the broader and more complex issues that will face its construction.